The Paris Motor Show is not yet upon us, but that hasn’t stopped Renault’s media department in the Netherlands from spilling the details on the updated ZOE ZE 40. The new edition of the ZOE comes with 41 kWh of batteries on board, good for 400 km/248 miles of range in the R90 (ex-R240)/non-base trim. Renault notes an expected real world range of ~300 km (186 miles). Renault says that the new offering will be on sale from October 1st. The older edition (22 kWh/Entry) will still be available. Best of all, the extra battery only adds about 2,500 Euros of cost! As a point of reference, the current max range of the Entry ZOE with a 22 kWh battery is rated at 240 km (150 miles) NEDC. The new/larger battery ZOE sees its motor power output at 65 kW/88hp over the base car’s 57 kW/77 hp. The new 41 kWh battery is developed with LG Chem, and takes up the same space inside the EV as previous editions, and also weighs about the same. Quickcharge option is also available (Q-series cars). We assume the standard 22 kW three phase is still in play on all models, and 43 kW quickcharge option. Of course, when Renault officially releases the new ZOE ZE 40 (likely early on Thursday morning), we will have all the additional quotes, photos and specs one can handle. Hat tip to Adrian W/Markus H! 121 Comments on "New 2017 Renault ZOE ZE 40: 400 km Range*, 41 kWh Battery"
Anyone have a guess at what this would get rated by the EPA if it were for sale here? I often have a hard time comparing range on cars sold only in Europe or Japan because of their different testing methods. Efficiency is frequently a red herring since it depends heavily on charging efficiency, and, for most people, the pertinent efficiency would be range per kWh of battery capacity. IOW from the battery not from the wall. You are right, but I don’t think the error this introduces is so large as to cause any serious problem making ballpark estimations. Since it is smaller and has a better cd (0.29) than the Bolt, the range should be much better than 150 miles, probably more than 180. Smaller has no influence on cd, but on aerodynamic drag. He didn’t claim it would.. Probably 2/3rds the range of the Bole EV. Likely the same chemistry and the three most important factors in range for a BEV are battery pack size, battery pack size, and battery pack size. Things like Cd and motor efficiency have proven not so important. (Compare the Idaho National Lab test of the BMW i3 and the Tesla Model S. Or the fact that the Bolt EV goes further than the Model X or Model S in their base configuration, but not all that much further). It’s not that Cd isn’t that important; it’s that Cd is only half the equation for drag: CdA, which includes frontal area (A). The superiority of improved streamlining is clearly demonstrated by comparing the EPA range ratings of the Leaf and the Model S, in those years when they used the same test cycle. Despite the Model S being a considerably heavier and slightly larger car, it has almost exactly the same energy efficiency, in terms of miles per kWh, as the lighter and less well streamlined (higher Cd) Leaf. The i3 is pretty extreme in its optimization for low drag. It even uses special narrow tires to reduce drag. The i3 is also considerably lighter, due to its lightweight CFRP (Carbon Fiber Reinforced Polymer) body. As a result of these factors, it has considerably better energy efficiency (again, in terms of miles per kWh) than other BEVs of its generation. It will be interesting to see if the new generation of BEVs — the Bolt, the Model ≡, and others — will be able to better the energy efficiency of the previous generation. I’ll be surprised if they can match the i3, but we’ll see. EV are efficient enough for me. I could not care less about apercentile up or down. Whats important is everyday life range. If that requires a bigger battery pack, so be it. In terms of MPGe, Bolt surpasses new i3 with bigger battery. That will make Bolt the most efficient car in the world when smaller battery i3 is dropped. Yes. The Model 3 will need to be 16.8% better than the Model S in weight and/or CdA to match the Bolt for efficiency. I suspect the new Zoe is as efficient as the Bolt. If so, Nissan should rebadge it and offer it in the US. If they could get the MSRP below $30K, it would be a big seller. I suspect one reason Zoe never came to US is because it’s so poor performing compared to SparkEV. If new Zoe comes to US, Chevy could reduce Bolt battery to 40 kWh and sell it in low to mid 25K post subsidy. With 200 HP on tap, there’s no contest between similarly priced Zoe and Bolt. Zoe will play while SparkEV and Bolt are away! By the way, you forgot SparkEV in that comparison. SparkEV has better MPGe than new i3. Here’s more complete comparison. Given that smaller SparkEV that’s size of Zoe is worse than Bolt, it’s hard to know if Zoe will be much better. Also compare iMiev and 500e to see that MPGe is hard guess just based on size. I didn’t forget it. I was thinking of cars sold outside of CARB states. I assume, if Nissan/Renault went to the trouble of introducing a rebadged Zoe, it would be available everywhere, like the Leaf. When you’re comparing MPGe, it doesn’t matter if the car is sold in CARB states or not. I wonder how SparkEV rates in Korean “EPA”, a country where Tesla is not yet sold, but SparkEV is. As for Zoe, if they release it widely in US, it’d be disastrous, and have similar reception as iMiev. Mitsubishi Mirage has far longer range, yet people don’t want to drive under performing car. A ZOE in the US might not make sense since its AC fast charging. But the Nissan Micra EV (or whatever it’s called that Nissan will show tomorrow) would make sense. Wow, I had no idea EV1 is so much less efficient that SparkEV (or pretty much most of today’s EV). Why is this? Since it’s more aerodynamic, I can only speculate that it’s due to poor electronics. By the way, you can’t have EV1, but you can have SparkEV anywhere in the world; just buy it and ship it. That’s how people in KS, NJ, FL, NY, CO, etc. etc. are able to drive SparkEV. My guess is 170 miles epa. They said the range real world is 180 ish… I really hope they bring it over to the US. The more the merrier. I imagine everyone has the same problem with the European ratings. We know the European testing method results in significantly inflated ranges, but there doesn’t seem to be any consistency to just how inflated they are. I know the Japanese testing methods are similarly inflated, but I don’t know if they are consistent or not. Thank goodness that here in the USA, the EPA has actually come up with an EV range rating system which seems to be a pretty close fit to real world driving range. We’ll the Twizy and Fluence ZE were outliers. The packs were terrible. Very prone to capacity loss too. In most cases you can dead reckon EPA range to be 2/3s of NEDC range for BEVs. There are some issues comparing PHEVs. The EPA cycle electric range for the 94Ah i3 is about 30-40 km short of the real world range for example. Absolutely wrong – our Twizy still makes 70-75 km in its third year with no faults whatsoever. Could do 80 km in the countryside for sure. I’ve run a Renault Zoe for the last 2 years, and just heard from Renault I can upgrade my battery for £3,100 to the new one. it’s an amazing car and the best Range I’ve had is to drive 76 miles with it saying 41 miles remaining under fairly ideal conditions. Also my average miles per kWh in the winter has been around 3.6 and in summer 4.5 Assuming you can get the same with the new one then 40 multiplied by the mpkWh would give a winter range of 144 miles and a summer range of 180 miles. How do I find out how to go about upgrading a Zoe to have the new battery (and accompanying range)? Take NEDC and minus 17% it is a reliable rule on all NEDC range. Does it have Apple CarPlay? That really is important in any new car for me. “charging is the same speed as other cars” – what the heck does this mean? I scanned your article and couldn’t see any kW rating for charging. Is it L2 and all that, like 9kW-ish max? The 22 kW charger is standard. Keep in mind that this is the 3 phase AC Type 2 charging connector, not the single phase Type 1 (or J1772) connector in the US. So it only takes an inexpensive AC EVSE, not a silly DC fast charger, yet it is as fast as most Chademo stations. The internal charger in the Zoe is just the motor electronics switched around, so it is light in cheap as well. I have to wonder just what strange motive someone would have to have, to call DC fast charging “silly”. Whatever motive it is, it’s certainly not one that favors a level playing field for comparison between different PEVs (Plug-in EVs). I suspect the assertion “The time required for charging the a.e. 40 battery is similar to that of a standard battery” is the typical “lawyer’s argument” found in advertising. That is, it’s only true from a certain narrow viewpoint. My guess is they’re claiming that the car can be recharged just as fast as others, based on percentage of charge rather than actual kWh. I for one have to wonder why it is that you so frequently resort to speculation about people’s motivations, instead of grappling with the arguments. As you may be aware, from a class called “logic 101” that I believe you’ve sat when studying computer science, the motivations for an argument have absolutely no bearing on the argument’s validity! And it’s not like you are unable to grapple with the arguments either. You often make good points and point out what is wrong with some objection. I just really wish you’d stop mixing this with smear tactics, attacks on character and the rest of it. I for one find it does you a huge disservice and distracts from the parts that are actually relevant and valid. And btw, you got it wrong about the narrow terms. You mean to say the opposite – that it is true only in kWh terms, but not in percentage SoC terms. If it were true in SoC terms it would mean that a twice as large battery charged twice as fast in power terms (twice the kW rate). So no liquid cooling on the battery? My next question is can I upgrade the batteries on a existing 22 kilowatt Zoe with the new 41 kilowatt batteries if they are the same size and weight? According a Renault Salesman, yes they are. The press release doesn’t mention anything about it, but rumours are it can. I, for one, sure hope so. We have a 2013 version (what is now called a Q210) and if we could get it to 270km real world range, I see a good reason to cancel one of the two Model 3’s we have reserved. I’ll be so annoyed if you can upgrade the battery on an older Zoe in EU, but can’t upgrade battery on older Leaf in NA (similar to the BMW i3). The fact that the battery has stayed the same size and weight proves that you could do the same for the Leaf (IMO). Nothing changes structurally; and with a bigger pack, the draw for the motor and charging with the existing hardware should be no different – the only difference should be more range for the end user. Bought my Leaf in 2014 believing that at some point in the future Nissan (or a 3rd party) would offer a battery better than what is in my car. I think that root cause is that battery pack is easy part of the upgrade and the hard part is electronics that oversee power flow in the car AND the engine itself. So whole powertrain would need to be replaced. That’s more then 9k if its to be profitable. Electronics shouldn’t change. Only software should matter, and it is trivial to have coded it to accept different battery sizes from the outset. Keep all charging rates etc the same. The Irony I’m facing right now is I got a new job were I can afford to buy a used Nissan Leaf. But the catch is the job is going to have me driving 60 to 70 miles a day. Which would be really pushing it on a low range Nissan Leaf with a 70 mile range. If they did offer a 41 kilowatt battery upgrade that would be a big range improvement. By the time Leafs are 10 years old there will be quite a few battery plants in Europe capable of producing aftermarket batteries for cars. It is hard to imagine that it doesn’t happen one way another considering how many Leafs there are on the road. And unless I sell mine today, it makes little sense to do so in the near future (40-60kWh competitors) before a larger replacement pack arrives that drives up its value again. Old Leafs will be minority by then, and subset of people who would like battery pack replacement as opposed to new car (those will be old and very cheap cars after all), will be small, and those who can afford retrofit will be even smaller subset. Small shops doing custom job? Maybe. Whole battery production plants? Not so much. In the case of the Leaf and specifically the older one, 2010-2012, that had battery degradation issue and no hybrid heating, a higher capacity battery would certainly have a market. It would in the case of those who also use their car a lot anyway and that would include me. Leaf is a great commodity car, but with limited range and even less range in winter with the older one. Battery replacement would also be a lot more environment friendly option than replacing the whole car that in the Leaf case will outlast the battery quite well. This and many other launches make me pumped for 2017. I definitely see myself having this until Tesla Model 3 which is at least two more years from now for us people in Turkey. If it also supports 3 phase AC charging we’re all set. It does. Either at 22kW or at 43kW depending on which version you would order. At least it’s an upgrade but it’s not enough. Granted, they didn’t raise the price much but it’s still pretty costly for essentially half a car. I’m just loving the second-gen EVs coming online now. Same pack dimensions, same weight, nearly double the capacity. One more step change and ICE will fade away like chemical cameras and VHS players. I do not agree, costs, charge times, lithium availability and power production are still issues for EVs. I think there will always stay a mix although the share of ICE will gradually decrease and EV increase. I hope this is not an indication of what the next generation Leaf will have. If the Gen 2 Leaf only has a 41kWh battery, that will be a huge disappointment. 60 kWh Leaf is already confirmed by Nissan. But they didn’t say when it will be released. The Zoe is supposed to be much smaller than the Leaf. Since Renault is not sold in the US, Nissan could maket the Zoe under another name as a smaller alternative to the 60 kWh Leaf. This would also allow the Leaf to offer higher end options like Adaptive Cruise Control while still giving Nissan an entry level EV with longer range. Next gen Leaf will not dissapoint, but you have to wait another 1/2 year to get the IDS size 60 KWh battery. 2018 will come early. New Zoe should get 200 miles or thereabouts as my Q210 model already manages a regular 110 miles on charge. If the 43kw charger remains on the Q model then a full charge in an hour? Nissan does not seem to be afraid to do several different size battery packs, so the Leaf could get the 41kWh pack and the larger 60kWh pack, and drop the smaller pack altogether. Next gen Leaf has to compete with Bolt and Model 3, along with the rest of the 200+ mile competition. Renault has not sold a car in North America for a LONG time. A rebadged Nissan ZOE with 41 Kwh pack would be a great stop gap before the 2018 Nissan Leaf with a 60 Kwh pack. The fact that Renault has gone with a LG Chem pack and not the Nissan pack states volumes. Is a Micra about the same size as a Zoe…? Maybe that’s the car we will get here. According to Wikipedia, Renault Zoe is classed as a Supermini (also called B-segment across Europe). The same is the case for the ICE cars Nissan Micra and Renault Clio. So they should all be about the same size. The Zoe is based on the Clio but is slightly longer, so it has a little more luggage space. The Clio & Micra are certainly comparable a.f.a. the size class goes, as is the Nissan Note. The LEAF is of course a larger size class. Until the Bolt comes out, this Zoe will be the EV with the biggest battery outside Tesla, congrats! Do not forget there will only be 25k Bolts so it is not an option for most people. Zoe got a boost of 41/22=1,86 times in battery size. Means if same cells, original Leaf would come 44,7 kW. Would be really cool if Nissan would offer replacement battery of 44-45 kW to original Leaf and then 60 kW for Leaf 2.0. I think such upgrade to existing car, now almost 6 years in production, would give a real boost to Nissans image, also to EV-s in general . It would mean a new life for it, much better resale values. Some 7000 for upgrade to 44 kW I would be the first in line. We will know tomorrow! The LEAF gets the *same* battery, so it would be a huge surprise if it has more capacity! Remember that Renault has been advertising “useable capacity” all along. Whereas Nissan advertised the LEAF as 24 kWh, which is actually a rounding-up (from 23.6 kWh) of it’s gross capacity. Going forwards Nissan is adopting the Renault practice of advertising only useable capacity – a good move IMO. Yet another shovel-full of soil digging the grave for sub-100 mile range EV’s. Their day is truly numbered. Yep. My 2012 LEAF which has lost one capacity bar can’t retain much of what I paid for it. I feel truly sorry for the people, thankfully not that many, that bought a ZOE or LEAF or any other “affordable EV” in the past few weeks. Of course, they should have done their research and can’t really blame anyone but themselves. 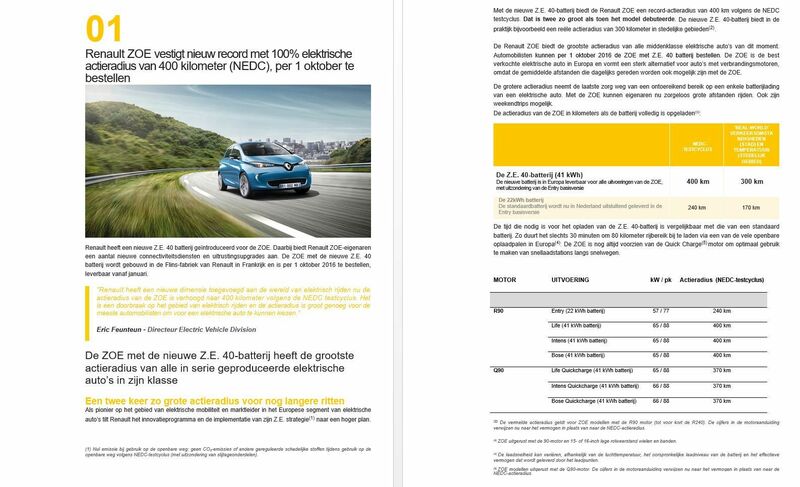 At the same time, I am sure I would be *pissed off* if I had taken Nissan’s bait (they have been running loads of ads lately boasting about the “new” battery – the 30 kWh one) and bought a LEAF, only to discover one week later that they then offer 70% more range for virtually the same price. I would feel dumb, but also that my ignorance had been ruthlessly exploited by sleezy salesmen. I guess it is difficult to avoid this conundrum when progress is going so fast. But it certainly is a bigger problem in items as expensive as cars than it ever was with computers and cell phones. Actually, come to think of it, it may have been even worse in the early days of computers since they did initially cost a lot more than a car! I agree, but I would fix the improvement only 3 times better for 2013 MY and later, and this is a lot. It happen to be the different capacity ratio. Remember that the Bolt is also more efficient, have more regeneration and have hybrid heating. It might also have better insulation and more stuff that don’t drain as much energy than the one in yours and mine 2012 Leaf. BTW, It seems there is a great discrepancy in the rate of fading capacity for the Leaf battery. Mine lost the first bar at 105 000 kilometers. Not sure if it’s only owners habit that could make such a difference. The Zoe Power is 65 kW. Theres no modificaciones here. Normally the Nissan Leaf operates in Eco-mode. When switched off the Leaf is absolutely ‘more eager and willing’. It has enough torque to occasionaly spin the (fuel-saving) front wheels. On my shorter city-trips I cannot resist playing with that eco-button to surprise others at the traffic lights. It does not make the Leaf a sportscar but it sure puts a smile on my face. I agree that the Bolt’s performance is better than most of its ice competitors(Honda fit, Chevy sonic). However, it is not performance competitive with other cars in it’s price range. At $37,500, the BMW three series Mercedes C class Audi A4 and Cadillac ATS all have better performance. Remember the current Zoe is sold as having a 22kWh battery (this is the usable capacity of the battery). The actual battery size is rumoured to be 26kWh. If Renault are sticking to this selling strategy, the true battery size will be more like the 44kWh size rumoured before this data release. Also remember that the Renault battery and the Nissan one are not the same shape + the Renault battery has forced air cooling, this battery does not fit the leaf. For those of you in the US the Zoe is a B segment car, so it’s roughly the size of a Ford Fiesta, or VW Golf, just a bit taller. What do you mean by *only* 2,500 Euros? You only rent the battery for Renault Zoe, so why should the purchase price go up even 1 Euro? You would think it would only affect the rental price of the battery and not the purchase price of the car without battery. The battery is also priced partially in the car. They sure want not the competition know what the battery cost. They do it also with the Leaf. Re-read. The ZOE is now available to buy with battery included, and the difference between the old and new battery when purchased is 2,500 euros. Are you saying the price does not increase EUR 2,500 for the new battery rental model compared to the old battery rental model? Anyway if you couldn’t purchase the battery before the price of the the car including battery can’t increase EUR 2,500 if there’s no previous model with battery included to compare with. I think Nissan did not spoke about battery rental scheme at all here. Just MSRP if buing whole car with battery. Battery rental is a bit different scenario as Nissan also provide assurances (like replacing battery if it degrades too much, etc.). So its priced a bit differently then just sticker price of battery. But if you couldn’t even buy the whole car with battery before it makes no sense to talk about an increase in MSRP for the car with battery as there’s no previous MSRP to compare to. I don’t think you can buy the whole car with battery of the current model in the Netherlands. I have read that in Norway, Renault sell the Zoe including battery today because they couldn’t sell it with rental battery. But AFAIK in most other countries including the Netherlands you can only buy it with battery rental. That’s why I think the EUR 2,500 price increase in the Netherlands must be for the battery rental model. But “Goelectric” mentioned you don’t pay full price for the battery rental, but that some of the battery expenses is included in the car purchase price. With that it mind a EUR 2,500 price increase for the battery rental model could make sense. In Norway & the UK (possibly elsewhere) it was already possible to buy a Zoë with battery, rather than leasing it. Probably because they don’t want customers to rent 3rd party batteries. If they charged the full rental price for the battery, 3rd party companies could start competing on battery rental. I know what you mean, but they want to do a mix calculation. So if you lease battery, you also pay a part and if you buy it complete the battery the price is not 7900 € like the difference, its more. But normally in Europe the Leafs with battery inclueded are better deals than the Leafs with rent, you get more discount. I will order at 1 Otkober, hopefully also a Leaf than my wife get also one. That seems expensive if compared to similar ICE cars. That seems a tough sell for EVs. Furthermore, the variable cost per km of an electric car is about 3€c/km whereas the cost of a petrol car is about 8€c/km. Still, I agree, driving electric without incentives, will be more expensive for the time being. Does the Zoe have a battery TMS? That is not a correct interpretation. The Zoe always had a 65 kW motor, but the entry level Zoe has been reduced from 65 kW to 57 kW. So actually, this is a regression, not an improvement. Thanks arne-nl, we are working from a dutch press release, (= Fixed! This lower cost electric motor is probably the same that will be used in the new Smart ForTwo ED, Smart ForFour ED and Renault Twingo ZE. Goodbye NISSAN!! You really screwed up on this one! You only had to do ONE THING RIGHT… and that was Thermally manage the battery. The one thing that killed your relationship with all your original Leaf owners… you just screwed up again..
we already said our goodbyes to Nissan and their Leaf. driving a 2016 Volt and cant understand why we got that Leaf. You do realize Nissan & Renault are the same company now? It’s a pretty safe bet that whatever battery tech the new will have Zoë, the next-gen LEAF will have the same, only a bit larger (since it’s a larger car). To day a friend of mine borrows my car and I have his Zoé for a day. As I have to visit my aunt in Paris, it was a good occasion to test the Zoé. I drive from Orléans to Noisy Le Grand, a 128km and when I arrive at Noisy the computer tell me that I have 14km more to drive. During the lunch I charge from ~10% to 85% in 1 hour. So for information the Zoé with usable 22kWh can reach 142km. The road speed limite was 110km/h in some portions, but I didn’t drive more than 100km/h. It’s take me ~1h40 but with my petrol engine it’s take me ~1h20. Perhaps the Zoé with 41kWh can reach ~285km in real life, but the EPA rate will probably about ~265km or a little lesser. But in urban use, the Zoé 41kWh can have a little bit more than 300km of range. In motorway and at a speed of 110km/h the Zoé need 18kWh for a 100km. You can’t expect more than ~225km of range. And in France the price will be ~26.000€ VAT included and incentives. It’s will be cheaper than the Leaf 30kWh and the e-Golf 36kWh. 22 KWh to 41 KWh is a significant improvement and hope this will help Zoe hit 100,000 sales and Renault 200,000 sales soon. Upgrade of battery possible as stated by Eric Feunteun!!! If Nissan does the same, i.e. let the old 24 kWh LEAF drivers upgrade their batteries to the new 40 kWh they will make many LEAF owners happy and restore a great deal of second hand value of the first LEAFs. I have thought for a long time the the 200 mile range is kind of the floodgate situation, provided it can be delivered at a price that is – more or less – within reach for the customer. At that point, why would anyone really want to buy a gas car! Certainly the Bolt(238 mile) and Zoe (186 mile) meet the requirements. Especially now with the charging network increasing everywhere. So even if the battery technology never evolved more beyond this point it would not really matter. Also, it might be nice if manufacturers install slightly bigger controllers and motors(say 10-20% more). This gives extra performance if needed and might also contribute to longevity overall. Additionally, a bigger battery means that, on average, the system will not be deep-cycled on a daily basis(full charge/discharge). This should mean that after several years the range of the battery would not be quite so hammered. So the future for EVs is bright folks.. its kind of solved.